Although the country remains outside the European Union to maintain its neutrality, Switzerland does enjoy extensive trade with its European neighbors, the United States, and other countries around the world. Switzerland is also home to large multinational corporations such as the banking giants, UBS (NYSE:UBS) and Credit Suisse (NYSE:CS), and the consumer products company, Nestle. Switzerland's currency plays an important role in the international capital markets. Because of Switzerland's historic political neutrality and reputation for stable and discreet banking, the Swiss franc is commonly viewed as a safe haven in international capital markets. As such, many investors prefer to hold a portion of their assets in the Swiss franc. Many other traders flee to the safety of the Swiss franc during times of international turmoil. Therefore, when volatility appears in the financial markets, investors often bid up the Swiss franc at the expense of other currencies. Although it is somewhat less liquid than the euro and the pound, the Swiss franc is still an easy currency to trade. In April 2016, the Swiss franc was on one side of 4.8% of all trades, which is substantial when you consider the overall size of the forex market.The factor most likely to cause large movements in the value of the Swiss franc is international political and economic instability. 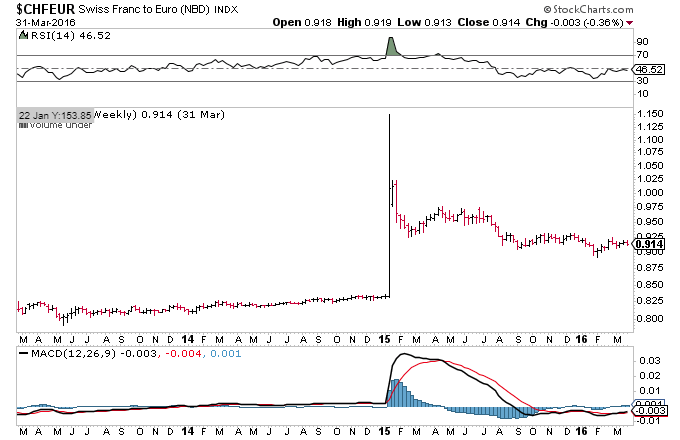 When either political or economic turmoil increases, investors flee to the perceived safety of the Swiss franc. When volatility decreases, the Swiss franc typically sees less interest from traders and investors. While the Swiss franc often does rise against most other currencies during volatile periods, forecasting the relative performance of the Swiss franc versus the U.S. dollar can be difficult, because the U.S. dollar is also viewed as a safe haven during times of turmoil. Therefore, it is not always easy to determine whether the Swiss franc or the U.S. dollar will be the preferred source of safety during an international crisis. Since each crisis is unique, a determination must be made as to whether the Swiss franc or the U.S. dollar is the preferred option for investors seeking safety. Is The Swiss Franc A Good Investment? Individual investors, businesses, financial institutions and even countries have been keeping their money in Swiss francs. Is The Swiss Franc A Safe Haven? We examine when and why there are runs on Swiss francs. We look at the recent and historic strength of the Swiss franc, as well as recent actions by the Swiss National Bank. Find out what you need to know before you start trading the Swiss franc. Switzerland's tax haven allure is being threatened by efforts by the US and other governments to make Swiss banks give up their much-vaunted secrecy. Will Bitcoin Become the new "Swiss Bank Account"? As Swiss banks become reluctant to open secret accounts for Americans, some of these banks are turning to Bitcoin as a workaround measure. Discover more about Swiss National Bank's holdings of financial assets, and look into its recent accumulation of foreign equities. Despite challenging times for some Swiss firms, investments in the Swiss stock market are still considered a safe haven and ETFs are an interesting option. The euro has been falling...does that mean it's now a bargain? Explore detailed analysis and information of the top three Swiss exchange-traded funds that offer exposure to the Swiss equities market.